Spending nearly $1T on deficit overloading tax cuts, then lighting it on fire with 8 rate hikes (nine since December 2015) and an experimental $430B of Fed balance sheet reduction, will go down as one of the most destructive policy mistakes in the history of the Republic. From 2010-2016, central bankers enabled run-away corporate borrowing, now credit markets are telling them they’re pulling away from the steroids far too quickly. There have been far more rate hikes than meets the eye. As we can see above, financial conditions are already as tight as found during the 2015-2016 oil credit crisis / China currency devaluation equity market sell-off. Back then, the Fed went on (rate hike) hold for 12 months. Fed fund futures are now pricing in just under 10% probability of just one rate hike in 2019. The Fed and U.S. economists are saying 2-3, high yield (credit markets) market saying zero. Who do you believe? Credit markets are freezing up, recently companies have NOT been able to raise capital through the $1.6T US high-yield bond market. The first full month since November 2008 (just after the failure of Lehman) that not a single junk bond has been able to price in December. Junk bond maturities will soar to $110B in 2019 from $36B in 2018, according to Moody’s Investors Services. And we expect that number to double to near $200B in 2020. For highly-levered companies who must roll their bonds over when the principal payments come due, a sharp rise in borrowing costs will catch them grossly ill-prepared, it’s a death sentence. When Chair Powell tells you the Fed will hike 2-3 times in 2019, he’s being Pollyannish, to say the least. In the real world, credit market functionality runs Fed policy, NOT backward looking U.S. economic data. If you give us a colossal debt maturity wall vs. a Fed chair, the wall wins EVERY time. *Moody’s data, combined leveraged loan and high yield bond maturities. Two to three more rate hikes? Who are they kidding??? “In the US, investment grade debt outstanding has grown from $2.3T in 2007 to $6.1T heading into 2019. In the next 3 years, a large load of $1.3T is coming due, which is 3.5x greater than what we faced in 2007. ” With our associate Ed Casey. Mr. Powell, are you listening to Leveraged Loans? The global debt markets – especially US credit – have ballooned in size since the financial crisis. If you think of the reasons behind a rate hike (besides reloading the stimulus quiver), they basically boil down to the Fed’s ability to reprice assets and slow capital formation to stave off inflation. The repricing of assets is first felt in the debt markets. The fact that these markets are now substantially larger than they have ever been (having grown at a double-digit clip in corporate credit and even faster in government-issued bonds), makes the impact of even a modest hike exponentially more powerful than ever before! With this fact in mind, Why are U.S. economists sooooo focused on domestic economic data? Their eyes should be on credit risk. This is a major flaw in our view – in the post-Lehman era credit risk has been driving the Fed policy path bus. It is not hard to calculate the amount of monetary value being repriced by a mere 25 basis point hike and see that it is far more powerful than ever before. The term duration refers to the percentage of gain or loss in bond prices for a given shift in interest rates, usually 100b basis points. So, for instance, a pool of bonds with a duration of 2.5 would have about a 2.5% gain in value for a 100 basis point cut in rates and about a 2.5% loss in value for a 100 basis point hike in rates. One of the most popular bond indices, the Barclay’s U.S. Aggregate, has a market value of $20.9 trillion today. This compares to a market value of $8.3 trillion at the time of the last rate hiking cycle kick-off on June 29, 2006. A look around the world is an eye opener; the Barclay’s Global Aggregate has a market value of $46.2 trillion versus $21.9 trillion on June 29, 2006. Some of this is already priced in of course, but the quick and dirty calculation tells you that for the U.S. Agg, a 25bps hike has 2.53x the impact of a 2006 era move and for the Global Agg, the impact is around 2.36x a 2006 era move in terms of the value of immediately repriced assets. This gives the adage “interest rates up, bond prices down” profound new meaning. Put another way, the amount of losses by global bond investors in percentage terms for a given hike in rates is around 2.5x as powerful as it was the last time the Fed hiked rates over nine years ago. So might 25bps act a bit more like 62.5bps? Over the last few months, credit markets have been screaming this fact, are you listening? Economic Data Still Strong? We must keep in mind, there are public and private economists who actively try and sell investors on economic modeling and follow-on equity market impact. Well, this crowd has been embarrassed in recent months. In November, ISM Manufacturing PMI came in with a healthy 59 handle. During the 2015-2016 equity market sell-off, she printed down at 48. There was NO warning for U.S. equities here. Bottom line, listen to credit markets, not economists. Recession in 2019 or Does that Even Matter? A 2019 recession will be more than an inconvenience for companies who rely on an easy money gravy train, or access to capital markets to stay afloat. Rolling over the debt during an economic downturn is no fun, especially when rates for high-yield paper shoot up, only adding to the pain of keeping debt on their already stretched balance sheets. “What blows my mind are the U.S. economists who are so focused on backward-looking economic data. With leverage this high, you need perfectly functioning capital markets period. Credit markets ALWAYS trump economic forecasting” said Larry McDonald, founder of the Bear Traps Report. Think of it this way, the St. Louis Fed and Goldman Sachs are both calling for 2.5-2.6% Q4 GDP growth, but does that even matter while companies cannot roll-over sky-high piles of debt? Bloomberg data, with leverage like this, there’s little room for error. One of the most popular bond indices, the Barclay’s U.S. Aggregate, has a market value of $20.9 trillion today. This compares to a market value of $8.3 trillion at the time of the Fed rate hiked rates during the last credit cycle on June 29, 2006. A look around the world is an eye opener; the Barclay’s Global Aggregate has a market value of $49.2 trillion versus $21.9 trillion on June 29, 2006. Some of this is already priced in of course, but the quick and dirty calculation tells you that for the U.S. Agg, a 25bps hike has 2.53x the impact of a 2006 era move and for the Global Agg, the impact is around 2.36x a 2006 era move in terms of the value of immediately repriced assets. This gives the adage “interest rates up, bond prices down” profound new meaning. Put another way, the amount of losses by global bond investors in percentage terms for a given hike in rates is around 2.5x as powerful as it was the last time the Fed hiked rates over nine years ago. So might 25bps act a bit more like 62.5bps? Recent price action in the stock and corporate bond markets are screaming this fact at us today. From late October to late November, U.S. equities were flat, but junk bond credit spreads over U.S. Treasuries were nearly 50bps wider, or higher in yield. Credit was telling you, there’s more pain ahead for U.S. equities. Goldman Sachs just shaved its growth forecast for the first half of next year, from 2.50% to 2.00%, once again credit markets have been two steps ahead here. Listen to credit risk, NOT economists. Junk bond companies trying to refinance their hefty debt load, also have to deal with the tax bill passed through Congress and signed by President Trump a year ago. The new legislation raised the cap on how much an issuer could deduct in interest payments from their profits. As a result, highly levered companies, who no longer qualify for the tax loophole, will have less cash to pay back the interest on their bonds. “Diminished ability of highly leveraged companies to service high-interest costs would worsen their refinancing opportunities,” warned analysts at Moody’s Investors Service. How does one spot the end of a great bull market and the birth of a bear’s mauling? We can start with the Dow Theory. The Dow theory asserts that major market trends are composed of three phases: an accumulation phase, a public participation (or absorption) phase, and a distribution phase. Bottom line; it’s a classic indicator of real selling. Just before the genesis of a bear market, the weak hands are flushed out. Fast money investors without deep investing commitments run for the hills first. In July, we did a solid job for clients in getting them out of the FAANGs (shorts as well), another classic, fast money hang-out. To us, what makes this indicator so important is meticulously measuring signs of real money selling. In many instances historically, the real selling doesn’t begin until there’s a Dow Theory signal. Beware, we may have touched a trigger Friday, just as the Fed continues to pursue their beloved rate hikes. Pick up our latest report here. The Dow Theory on stock price movement is a form of technical analysis that includes some aspects of sector rotation. The theory was derived from Wall Street Journal editorials written by Charles H. Dow (1851–1902), journalist, founder and first editor of The Wall Street Journal and co-founder of Dow Jones and Company. *Deeply embedded in a bear market: Eurozone banks EUFN are 35% off their 2014 highs, German equities EWG are 30% off their January highs, Italian equities EWI are 32% off their 2014 highs, UK equities EWU are 32% off their 2014 highs. US retailers are on course for their biggest quarterly sell-off since the financial crisis. It’s important to note, US economically sensitive sectors (transports, regional banks, home construction, consumer discretionary) dramatically underperforming above. Credit markets are freezing up. This month companies have NOT been able to raise capital through the $1.2tn US high-yield bond market. This would mark, the first full month since November 2008 (just after the failure of Lehman Brothers) that not a single junk bond was able to price. Over the years the Dow Theory had many ambassadors, none more prominent than Richard Russell. He was born in New York, the son of Hortense (Lion) Russell, a novelist, and Henry Harold Russell, a civil engineer. He began publishing a newsletter called the Dow Theory Letters in 1958. The Letters covered his views on the stock market and the precious metal markets. Some say the Dow Theory has been ahead of the market for nearly a century. One academic study from the 1990s calculated the theory’s track record over the prior seven decades, back to when it was created in the early part of the last century; the study found that the Dow Theory beat the broader market by an average of 4.6% points a year. People conflate the Dow Theory sell signal and the philosophy behind it. The overarching idea is that transports fall before industrials because the timing of their business cycles is different. But that isn’t the same as the Dow Theory sell signal. It’s the underlying theory supporting the Dow theory sell signal and buy signal. Dow theory should not be confused with Dow Theory signal. Dow Theory Triggers: Above you can see three lower lows in the (yellow) Dow Jones Industrial Average, -10.3% off her September highs and two lower lows in the (white) Dow Transportation Average, -18.3% off her September high. There have been significant tops that Dow Theory sell signals did not catch. So paying attention to the philosophy may prove more important than catching a classic signal. Market participants need to review the theory at this point, there’s too much on the line. Friday, we closed right at major support on the industrials. A flush from here would bring colossal real money selling, and confirm the beginning of a new bear market in our view. What we found particularly troubling about yesterday was that we had good news on China and the market still flopped. One important risk indicator we use is the Index of NYSE stocks % above their 200-day moving average. On Friday, she touched 23%. In the Post-Lehman era, this level has only been breached three times; 2011, 2015 and 2016. US equities as measured by the S&P 500 bounced 31%, 16% and 21% in the six months following these HIGH capitulation levels. Some argue the Dow theory isn’t triggered until the averages (Dow and Dow Transports) go to a new high and the other DOES NOT. The idea being you have an UNCONFIRMED new high FOLLOWED by CONFIRMED new lows. To our eye that has not happened. Wall St. lost a legend five years ago this week. Over the last two decades, Larry McCarthy was probably most respected junk bond trader, a man with fearless resolve. He was one of a kind and touched so many people in positive ways. The only thing that outshined Larry’s inspiration to others was found in his generosity. Stories of Larry’s passing have been widely read. Over the last week, his profile was the most viewed globally across the Bloomberg terminal. He will be missed by many, the man left a mark. 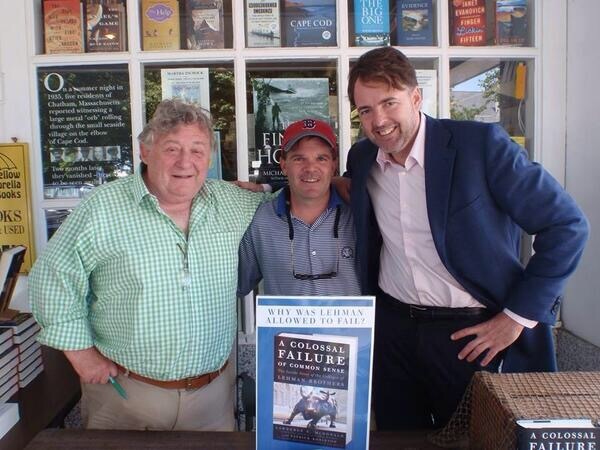 Authors Patrick Robinson (left), Larry McDonald (right) and Larry McCarthy (middle). Best known for New York Times #1 Bestseller “Lone Survivor,” Patrick Robinson joined Larry McCarthy and Larry McDonald at speaking events across the U.S. in the summer of 2009. He’s best known as the former Lehman Brothers’ executive who predicted that credit-default-swap traders were “working on bringing down the whole world.” McCarthy placed over $1.5 billion of bets against Countrywide Financial and Beazer Homes, he was a trader with unique market insticts, true vision. Before the crash, he wisely left the doomed firm in 2007, and made his fateful declaration to a large audience at his retirement party. It’s the stuff legends are made of. Hidden below, are some classic trading lessons that have more to do with psychology and attitude than anything else, virtues McCarthy mastered. It was the Fall of 2005, the one person in all of Lehman Brothers who believed implicitly that analyst Jane Castle was correct, was Larry McCarthy. One of the most fearless traders ever to work on Wall Street, he would hear no word against her assessment of the Delta situation, and indeed had, working in concert with Joe Beggans and I, bought $750 million worth of the airline’s bonds during the company’s bankruptcy. He was keenly aware that it may be months before the price climbed to the levels Jane predicted. But he was sure of our position. And like all true gamblers, he was sure that his luck was running. As a matter of fact he kept buying all through the next month, whenever an opportunity came up. In truth, the situation at Delta itself did not really improve. Unrest in the Middle East continued, and the pilots were threatening to strike, which would blow Delta’s normal operations asunder, and cut off their cash-flow, which was, at this stage, their life blood. Larry was, however, adamant. It’s difficult to grasp the size of the gamble Larry was involved in, just as it’s difficult to grasp the type of man Larry was – it’s difficult to gauge his astuteness, the speed of his calculations, and the depth of his nerve. You’ll have to take my word for it, there was nothing ordinary about him. Larry McCarthy had stepped straight out of a scene from the Cincinatti Kid. He was world-class at both blackjack and stud poker. He was our very own Lehman Kid, cards or stocks, he had nerves of sprung steel, and a radar for those moments when Lady Luck was with him. He had a nose for victory, and an instinct for trouble. And when he scented the former, there was no shaking him off. He and I used to go off gambling together. I suppose it was in our blood, and there’s a lot of guys like that on Wall Street, cold and determined with the firm’s cash, but addicted to the chase, calculating the odds, the risk reward ratio. I guess we’re all junkies for the thrill of being right, of winning, always winning. I’ll tell you just one story about McCarthy, and then you’ll know precisely what manner of man held those Delta bonds. It was around that time in the year, as I said the Fall of 2005, and we had decided to have a couple of days up at Mohegan Sun, the spectacular Indian reservation casino in the deep woods of Connecticut on the banks of the Thames River. These were days of immense prosperity for the investment banks and we were entertaining some heavy-hitting clients. After dinner at Michael Jordan’s Steakhouse, we headed for the tables for some high-rolling blackjack. I settled into a modest corner where the stakes were around $50-$100. McCarthy went to $100-$500, a spot he had occupied many, many times before. But by any standards you’d have to say the cards were not running for him. He slogged it out, going head to head with the dealer, but nothing could change his luck. After two hours he’d blown a very large hole in $75,000. An hour later he’d lost $100,000. The dealer was pulling seven-card 21’s, and never busting. I saw him three times double down on a 10, and then pull a 10; only for the dealer to hit 21 again, and then again. The pressure was relentless. The shocking bad luck apparently endless. 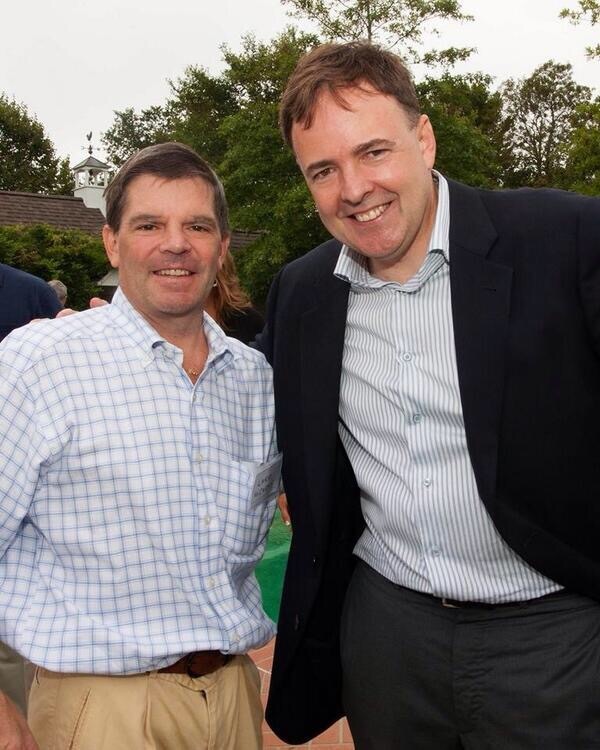 But McCarthy never flickered, never stopped smiling, never stopped wisecracking his way through the evening. Never once did he lose his cool, laughing cheerfully with the pit bosses, and the dealers, who knew, to a man, the cards had turned against him, before he even started. I just shook my head, at the sheer guts of the man. And he told me to call the pit-boss and get another $100,000. He was playing on, and his credit was good. Both on the trading floor and in the casinos, most guys run for the hills when things aren’t going their way. Bad negative attitudes, whiners and complainers. But not Larry. On the trading floor and at the tables, he was always Captain Cool, waiting patiently, lying in wait for his moment. He asked us to give him a little room. Then he collected his $100,000 and took over the whole table, all six slots. They roped off the area, except for him and me, and he started with $2,500 on each hand, that’s $15,000 on each round against the dealer. That gave him a very slight advantage, because there was no one else playing, catching the good hand. I watched him win a few, then lose a few. And then, suddenly, the dealer, ‘busted’ two hands in a row for the first time in close to five hours. Larry hauled back $15,000. Then he pulled something which was nothing less than a mind-blower. The pit-boss nodded, and came back with a new sign which read, “Table Max $10,000 a hand.” Larry proceeded to pile on his $1,000 chips, ten of them on all six slots. But the cards were not pretty. His best was a 16, but the dealer’s cards were worse. There was a six, but when the second card turned, it was the dreaded five, and this meant if she drew a face-card she had 21, and Larry was down another $60,000. The dealer, still under 17, had to go again. Almost 30 people crammed outside the ropes, watching this fight to the finish, holding their breath. The dealer turned the card. It was a three, which made 14. Larry never blinked. The dealer turned again, an ace, for 15. Larry stared straight ahead. And the dealer turned again, and pulled yet another ace. That was still only 16. This was sensational. But the dealer had to turn again. And it was as if the heartbeat of the entire casino had come to a halt. The pit-bosses had moved in and were standing watch with the crowd. Cocktail waitresses stopped serving, and a kind of telepathy swept around the gaming room. It was as if everyone was aware of the titanic struggle between the casino’s ace dealer, and Larry McCarthy from Wall Street, with $70,000 riding on the turn of a card. I watched the dealer gasp, and then reach for the ‘shoe,’ selecting the card. For a split second, the hand that covered that card paused, and then spun it over, to reveal the Queen of Spades. Dealer’s bust – 26. After five hours, Larry’s luck had finally turned, and he leapt at me, tackled both of us right off our stools, into the velvet ropes and on to the floor in front of all the spectators, both of us laughing fit to When we finally climbed back to our feet, Larry just said, “Okay, guys, let’s play some cards.” He swapped the $1,000 orange chips, the ‘pumpkins,’ for the $5,000 ‘Grey Ladies,’ and placed two of them on each spot, a $60,000 hand. And when the cards came up they were devastating – for the dealer. Four blackjacks and two 20’s for Larry ! Against the dealer’s pitiful 17. And what he said was true. I’d watched this man, beaten and beaten, and in the next two hours I watched him ride his luck, all the way back. When we walked out of there, he was $475,000 in front. I saw it with my own eyes. I think for the first time, I finally understood why Larry McCarthy was a full-blooded Legend of Wall Street, and his name would live for a long time. Larry McDonald is creator and editor of the Bear Traps Report, a weekly independent investment letter focusing on global political and systemic risk with actionable trade ideas. Larry serves as a political policy risk consultant to hedge funds, family offices, asset managers and high net worth investors. Larry was former Head of US Macro Strategy at Societe Generale, and frequent guest contributor on Bloomberg TV, CNBC, Fox Business, and the BBC. Larry is a NY Times bestselling author, his book “Colossal Failure of Common Sense” is now translated into 12 languages. He ran a $500 million proprietary trading book at Lehman Brothers, made over $75 million betting against the subprime mortgage crisis and was consistently one of the most profitable traders in the firm. His “Bear Traps” letter is one of the most highly regarded on Wall St. He’s participated in 3 major financial crisis documentaries: Sony Pictures, Academy Award winning documentary the “Inside Job,” BBC‘s “The Love of Money” and CBC‘s “House of Cards.” He’s delivered over 125 keynote speeches in 17 different countries, at Banks, Investment Firms, Conferences, Law Firms, Insurance Companies and Universities.